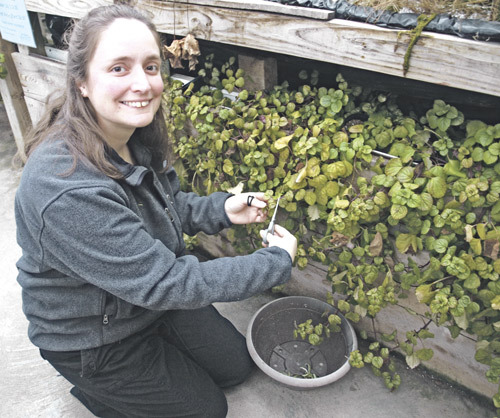 When Ben and Amy Lindner started growing vegetables and plants in an area already populated with numerous greenhouses, they knew they had to distinguish themselves in order to be successful. The couple established Tender Shoots Gardens and Greenhouse on Ben’s parents’ former dairy farm in Greenwood, WI. Both Ben and Amy have ag backgrounds, and although Ben was an experienced grower, he found starting a greenhouse from scratch wasn’t quite the same as running someone else’s greenhouse. The greenhouses are situated on an in-floor heat system fueled by wood. Vent tubes allow good air flow and shade curtains help manage temperatures throughout the year. Benches are three feet tall, a convenient height for both workers and customers. The spacious storefront is connected to the greenhouses, and an overflow house provides storage for perennials as well as baskets and pots planted for customers. Ben found that one of the most important aspects of being a grower – timing the sowing of various plants – is easy for him. When seeds arrive in autumn, he plans sowing dates according to germination time. Being aware of weather and temperature patterns in the area has been helpful in knowing when to start each species. Ben started growing for the upcoming season in December. 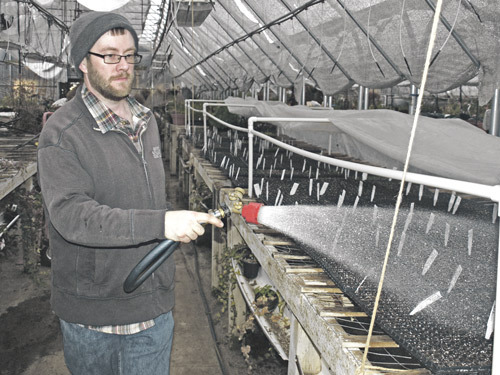 “We start between 120,000 and 150,000 seeds and about 20,000 cuttings,” he said. “For certain plants, I’ll have to add a couple weeks just to get them flowering in late April/early May.” Ben has achieved an average of 85 percent germination rate with seeds, and 90 to 95 percent success with cuttings. “I’ve started the super hot peppers like scorpion and ghost peppers because they take a long time to germinate,” said Ben. “I’ll start sweet peppers soon, and tomatoes in March.” Ben said some flowering plants such as ranunculus and lisianthus take a long time to start, and many perennials take a long time, sometimes months, to germinate so he starts them early. When it’s time to decide what to grow, Ben relies on records denoting which varieties have sold well over the years as well as what customers request. 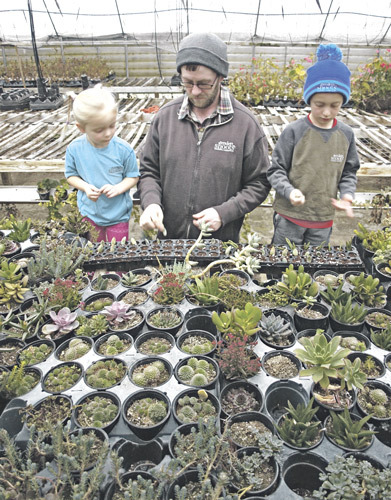 “People want those [plants] because it’s what they’ve grown and what they know,” he said. “They don’t want to try something new unless we say ‘Here – try this.’” The greenhouse is home to both standard favorites along with 10 to 15 heirlooms. Ben said one popular favorite is Sun Sugar, an orange cherry tomato, and he increases the number of those every year because people want it. Ben grows about 60 herbs, including several varieties of basil, thyme, oregano and mint. “The big thing lately is scented plants, especially lemon-scented,” he said. As Ben and Amy strive to grow what customers want, they’ve noticed an increased interest in gardening among young people. However, most want a smaller garden than their parents or grandparents had, or express interest in container gardens. When Ben is in the greenhouse helping customers, he’ll ask about their goals and suggest the most suitable plants for either a small garden or pots. To capitalize on each season, Ben and Amy keep an assortment of annuals and seasonal features to keep customers coming throughout the year. They also grow 200 varieties of daylilies – about 10,000 plants – and customers enjoy walking through the display when flowers peak in mid-July. Ben walks through the daylilies with customers, discusses what they want and digs a double or triple division. He also grows 500 varieties of hosta and sells plants throughout summer into autumn. Several members of the Lindner family, including Ben’s parents and his aunt, help throughout the year. Ben said since they aren’t in the greenhouse all the time, they enjoy the time and consider it therapy. Ben also hires local high school students who have proven to be reliable, can take direction and are willing to learn. Learn more about the business at www.tendershoots.net.